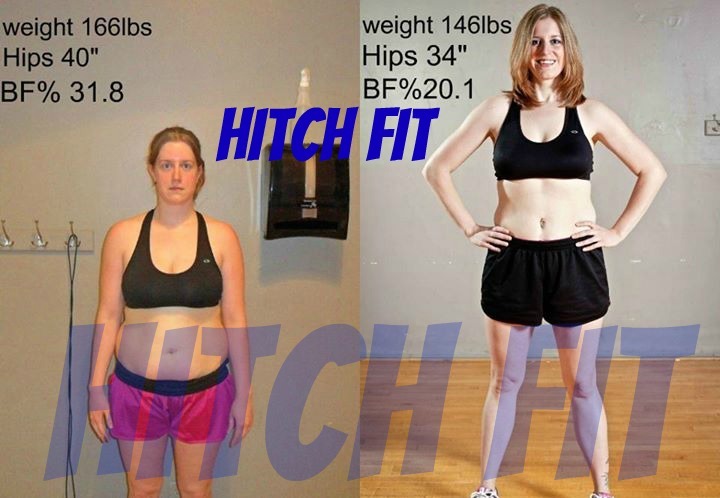 Kansas City Woman Sheds 20 Pounds and 11.7% Body Fat in 12 Weeks at Hitch Fit! 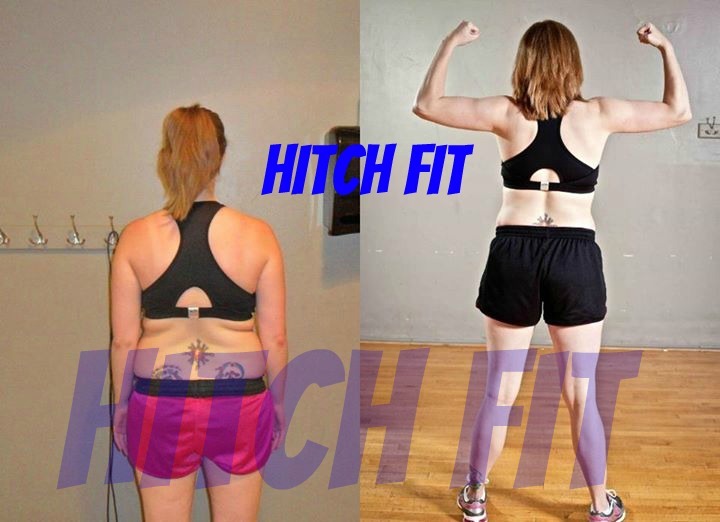 Home/Success Stories/Kansas City Woman Sheds 20 Pounds and 11.7% Body Fat in 12 Weeks at Hitch Fit! Transformation by Hitch Fit TRANSFORMER Joel Salter at Hitch Fit Gym in Kansas City! “My weight issues began almost 3 years ago when I got pregnant with my daughter in November 2008. My first weigh in at the doctor’s office to confirm my pregnancy I had gained 10lbs. I went from 145lbs to 155lbs in just a few weeks. I did not have an easy pregnancy. I had a problem where I was collapsing during my pregnancy. My doctor told me I needed to eat more meals throughout the day. I already had poor eating habits before I got pregnant. I took my pregnancy as a free pass to eat whatever I wanted. 9 months later I was 210lbs. Shortly after my daughter was born I weighed 185lbs and while nursing I was able to get down to 165lbs. After I stopped nursing I was still had poor eating habits. That’s when my weight started going up again. I went 2 ½ years without working out because I had complications during pregnancy and I was so tired after I had my daughter. I would also turn to food when I was having problems with my daughter’s biological father. He could say some of the most hurtful things. He wanted me to terminate the pregnancy at the beggining and when I refused he tried to bully me into putting her up for adoption all during my pregnancy. He told me during my pregnancy that we had no business raising a child and that I would not make a good mother. I would let him get the best of me. As sad as it is, I truly feel it’s for the best that he’s no longer in the picture. I know there are al lot of people out there who will probably never agree with everything I have given up for my daighter at the time. I don’t expect people to understand when they were not living through it. I had to ensure my daughter would always have a happy and stable life. She’s surrounded by love and such supporting families. It warms my heart to know how much my mother’s family and father’s family adores her. Everyone she meets fall in love with her. I spent so much of my time trying to do what’s best for my daughter and dealing with all the pain I was going through, I wasn’t taking care of myself. After my daughter’s first birthday my doctor sat me down and wanted to talk to me about my weight. I was back up to 185lbs and still gaining. That right there should have been a turning point for me but I keep listining to others say “oh you just had a baby a year ago and it takes time ot get back to your old body, ect.” Then the holidays rolled around with the Halloween candy, thanksgiving pies and turkey, Christmas chocolates, ect. My clothing kept getting tighter and tighter but I refused to buy bigger clothing. In Janurary 2011 I decided to make a change. I stopped drinking pop and eating fast food. It helped me lose some weight but I was still living in sweats because that is all that fit me. I watch my friends Brandi Wisdom and Andrea Kellgren transform through Hitch Fit and during that time my friend Jessica Baxter had started the program. Watching their transformations showed me that this was real and obtainable. There was no diet pill or it was not a fad diet. After Jessica’s transformation I signed up with Hitch Fit to train with Joel Salter. At the beginning everything was hard. I was so sore and the meal plan was so different from what I was used to. Once you make it past the first two weeks it gets so much easier. Each week I was able to work out more and more. The meal plan was a struggle at the beggining only because I wasn’t thinking outside the box. Joel worked hard with me on the meal plan and coming up with different ideas of meals I could make. I had a lot of help from Jessica on how to be creative with my meals. Joel has changed my outlook on food. I’ve been onmy meal plan for so long now that I can’t see myself eating any other way. I did have my struggles along the way and my moment of weakness. I feel like I could have acheived so much more if I didn’t have those moments of weakness. Once I started talking to Joel more about my struggles he gave me more options on what to do in those situations. I consider my time with Hitch Fit as a journey because I have overcome so much. I have so much more energy. I’m stronger than what I was before. I feel like the world is at my fingertips. I can achieve anything I put my mind to. This has given me a sense of freedom and has changed the way I feel about myself. I feel so good inside and out. I feel comfortable enough to wear shorts again. I have gained so much through this process and I feel like I have gotten my life back. For once in my life I’m actually living and not lying around on the couch all day. I think it’s funny when I hear people say “oh I could never give up this kind of food or I could never stay on a diet.” I was never on a diet. It’s a meal plan. My meal plan was a map for me to achieve my goals. I had to learn how to make a lot of things from scratch because it’s all about the substitutes. When you make your own foods you can control what is going into it. I have also learned a lot about portion control. I have found the meals I’ve been eating during this transformation to be more filling and satisfying than the junk I used to eat. Before Hitch Fit I always felt hungry and tired. Or call 816-753-8900 and request to train with Joel!